-The object of basketball is to score on your opponent’s team by putting the ball through their hoop while preventing them from scoring on your own team’s hoop. This is the basic premise if you’re learning how to play basketball. -2 teams of 5 players will play against each other for the designated amount of time. The team with the most points after time expires, wins. -Though time amounts vary, most games are played in 4 quarters of 10 minutes. The NBA plays 12 minute quarters, and the NCAA plays 20 minute halves. -Hoops are 10 feet high and are on opposite sides of a 94 ft by 50 ft rectangle court. -Players can’t take steps with the basketball unless they are dribbling the ball with one hand. If they take more than 2 steps without dribbling it is called traveling and they lose the ball. -A foul is when a player uses illegal physical contact against an opposing player. A player that has been fouled will either be awarded free throws or possession of the ball. The basketball must go through the hoop to get points. This is done by shooting. Any shot made outside the 3-point arc is worth 3 points. Inside the arc is worth 2 points. Free throws are worth 1 point. Jump Shot (jumper): Shot taken usually within the 3-point arc where a player jumps first and then shoots at the peak of their jump. Free Throw: Free throws are given after a foul. A player that was fouled will get to shoot at the free-throw line (which is 15 feet from the hoop) uncontested. Lay-in (lay-up): This is a shot taken as a player is running at the hoop. 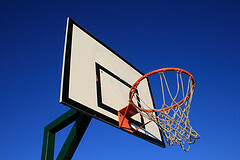 It is usually shot with one hand and as close to the basket as possible. Fade-Away: This is when a player shoots the ball while they are moving away from the hoop. Hook Shot: Brought to fame by Dr. J (Julius Erving), a hook shot is when a player that is sideways (both shoulders in the same line to the hoop) tosses the ball with the arm furthest away from the hoop. It is an effective way to shoot over defenders. Proper Shooting Techniques – though this is a controversial subject, here are some proven techniques that will help players shoot accurately. Plant your feet so they are shoulder-length apart. If you are right-handed, make sure your right foot is pointed at the hoop and half a foots-length ahead of your left foot. Line up you shot so that your shooting shoulder, elbow, and middle finger make a line towards the hoop. With techniques #2 in mind, make a table and a “T”. Your dominant hand (arm) should make a table that the ball can rest on without the other hand for support. Arrange your supporting hand on the ball to where your thumbs will form a disconnected letter “T”. Power from the shot should come predominantly from your legs. Focus your eyes to a point on the back of the rim. Imagine your are in a phone booth without a roof that you have to shoot out of. This will help you to remember to shoot the ball upwards, giving your shot needed arc. Cookie jar! Snap your wrist through the ball as the final extension of your shot and follow through. Your hand should look as though it is reaching in a cookie jar that is on a high shelf. The direction of the jump from your shot should always either be straight up or towards the hoop. Fading any other direction forces your shooting arm to recalibrate as a separate unit from your body and legs (which causes poor accuracy). Repetition. Keep these techniques in mind and practice shooting until you are too tired. As with everything, the more you practice the better you will become. A pass is when you throw the ball to your teammate. The most effective way to gain an advantage on offense is to pass the ball. Chest Pass: This is the most common pass. It is when the basketball is thrown directly from the passer’s chest to the receiver’s chest. Bounce Pass: When there is defensive pressure or when a player is wanting to get the ball to a post player near the hoop, the bounce pass is used. The basketball will be thrown to the floor about 2/3 of the distance to the receiving player and will bounce up to be caught. Overhead Pass: An overhead pass is when a player throws the ball over his/her own head to keep it out of the defenders’ reach. This is usually done on the perimeter to cross the ball to the other side of the court. Outlet Pass: An outlet pass is when the ball is passed quickly out of the backcourt in order take advantage of a fast break. This is usually done after a defensive rebound or after the opposing team makes a basket. Baseball Pass: This is when a player throws the ball with one hand like a baseball in order to pass to a teammate that’s a long distance away. No-look Pass: When a teammate passes in a direction that he/she isn’t looking as a way of misleading the defense. Dribbling is the act of bouncing the ball. Players have to dribble with one hand at a time in order to walk or run with the basketball. Players should strive to be able to dribble with their heads up (without looking at the ball) in order to see their teammates and the rest of the court. They should also strive to be able to dribble with either hand confidently. The crossover dribble is arguably the most effective ball handling move when trying to get past your defender. It is the act of changing dribbling hands and the direction of your body in a quick motion. Offense is the tactics and means to score points. If your team is on offense, your team has possession of the ball and is trying to score. Screen (or Pick): This is when a player on offense runs up and plants their body near a teammate’s defender in an attempt to free the team member from that particular defender’s cover. The teammate will see that you are setting the screen for them, and should run in close proximity past you so that their defender can’t follow (you’re screen is in their way). Fast Break: A fast break is when the offense sprints from their backcourt to their basket in an attempt to score before the opposing team can make it back for defense. Pump Fake: A pump fake is a quick movement that is meant to trick the defense into thinking you are shooting or passing. Jump Stop: This is when a player that’s dribbling jumps to a stop so that both feet land at the same time. The reason this is done is so that you can pivot off of either foot after you’ve stopped dribbling. Pivot: When you are holding the ball (without dribbling), one foot needs to be planted. A pivot is when you move your self around while keeping the “pivot foot” planted. Give and Go: This is a common play where a player passes to a teammate and immediately sprints towards the hoop, leaving their defender behind. The receiving player will then pass it right back for a lay-up. Pick and Roll: The pick and roll is one of the most effective offensive plays, especially in 2 on 2 or 3 on 3 basketball games. A player on offense sets a screen on the defender that is guarding the ball. The teammate dribbles past the screen, the screener then rolls his/her body towards the hoop and is passed the ball for an open lay-up. Posting Up: This when a player plants his/her self near the hoop in an effort to receive the ball and make a powerful move through or over their defender. The taller players will often post up, but a guard will too if his/her defender is considerably small or short. Teams will usually have a number of set plays to run on offense as a means of creating advantages and scoring points. These plays typically involve planned movements by players, passes, screens, isolations, and/or give and go’s. Point Guard – This is usually the player with best ball handling and passing skills. The point guard coordinates team efforts on the court and calls out specific plays for his/her team to run. The point guard will usually always bring the ball up court. Shooting Guard – This is usually the player with the best shooting skills. The shooting guard typically lingers near or around the 3 point arc on offense. This is so they can be available for an outside shot or to carry out specific plays on the perimeter. Small Forward – The small forward will typically have the same roles as the shooting guard, but there are differences. He/she will be more involved in penetration of the defense and will work inside the 3-point arc more often. Power Forward – The power forward will usually play their part on offense near the hoop and are taller and stronger than other teammates. They will be more involved in the “down low” play by screening for other players and posting up to get close-proximity shots. Center – The tallest player on the team, the center will often be isolated down low so he/she can post up on their defender and get close, high-percentage shots. The center will usually always stay near or around the hoop so he/she is available for rebounding. Defense is the tactics and means to prevent the other team from scoring. If your team is on defense, your opponents have possession of the basketball. Man-to-Man Defense – This is the most common. Each player guards a specific player on the opposing team and works hard in an effort to prevent that specific player from scoring. Players will usually “stick to their man” until there is a designated switch or until there is a substitution in the game. Zone Defense – Instead of guarding specific opponents for defense, players are assigned a section of the court to defend. When opponents are in a player’s assigned zone, he/she is in charge of defending those opponents. The most common zone is the 2-3 zone, in which the 2 guards will defend each elbow (corner of the free-throw line), the 2 forwards defend the boxes (either side of the hoop), and the center defends the middle of the key. Zone defenses will typically force the opposing team to shoot more outside shots because it is difficult to penetrate inside a zone. Box Out (block out): Boxing out helps your team get rebounds. When someone shoots, the defense should turn around and seal the players that they were guarding behind them. This is so no one gets in between them and the hoop for an easy rebound. Full Court Press: This is when a team defends players all the way up in the opposing team’s backcourt to try and force a turnover. Trap: A trap is when 2 or more defenders rush up on a player that has the ball, usually after that player has picked up his/her dribble. Block: This is simply when a defender gets his/her hand on the ball as it is being shot or passed. Traveling Violation: Players can’t walk or run with the basketball unless they are dribbling the ball. If they do, traveling is called and the other team get’s the ball. Double Dribble Violation: Players can’t dribble the ball, pick up the ball with both hands, then dribble again. If they do, double dribble is called and the other team get’s the ball. Carry Violation: Players can’t carry the ball as they are dribbling. This is usually called when the hand is near the underside of the ball while he/she is dribbling. If they do, a carry is called and the other team gets the ball. Out-of-Bounds Violation: Players can’t knock the ball out of bounds or have possession of the ball when any foot is out of bounds. If they do, the other team gets the ball. Kick-Ball Violation: Players can’t intentionally touch the basketball with their feet. If they do, the other team gets the ball. Over-and-Back Violation: Once a team has the ball past the half-court line, they can’t dribble or pass the ball back beyond the half-court line again. If they do, over and back is called and the other team gets the ball. 3 Seconds in the Key: No player that is on offense can stand in the key (the free-throw lane) for over 3 seconds at a time. If they do, 3 seconds in the key is called and the other team gets the ball. Delay of Game Violations: Once a referee hands a player the basketball to throw it in from out of bounce, he/she only gets 5 seconds to pass it in. Teams only get 10 seconds to advance the ball past half court. A player with the ball that has picked up his/her dribble has 3 seconds or less to get rid of it (a defender must be guarding him/her in order for the referee to call this violation). A player with the ball that is dribbling has only 5 seconds to either pick up his/her dribble or get rid of the basketball (he/she must be guarded within 3 feet by a defender in order for the referee to call this violation). Goaltending Violation: No player can touch the ball after it has been shot and is on the way down towards the hoop. It also can’t be touched if it has already hit the backboard or if it has a chance of going in. If a defender does do that, then goaltending will be called and the basket will be considered made (points will be given to the shooting team). Fouls: A foul is called when a player uses unfair body contact to gain an advantage. Most of the time fouls are committed by the defense when they are trying to get the ball. If a player is in the process of shooting and gets fouled, he/she will get the amount of free throws that the shot would be worth if they made it. If a player gets fouled while shooting and they make it anyway, the basket counts and they get one additional free throw (this is called an “and-1”). In most leagues, each team has only 7 fouls to give each half. If they foul more than that, it is called “the bonus” and the player who was fouled gets to shoot free throws even if they weren’t in the act of shooting. Fouls aren’t always committed by the defense. “Charging” is a foul called when someone on offense runs through a defender that has his/her feet planted. We hope this gets you excited about one of the greatest sports of all time and that you are closer to knowing how to play basketball!